A new application of synchronous satellite communications technology was unveiled in 1976 with a three-ocean maritime satellite system that is providing telecommunications services in the Atlantic, Pacific, and Indian Oceans. Hughes Aircraft Company under contract to Comsat General Corporation built three multifrequency communications spacecraft called Marisat for the space segment of the world's first maritime system. All three satellites were launched during 1976, one each on February 19, June 9, and October 14. 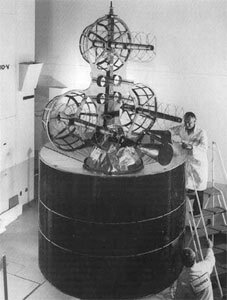 The satellites were placed in geosynchronous orbit at 15 degrees W, 176.5 degrees E, and 72.5 degrees E longitude, respectively. The specialized satellites introduced a new communications capability since they provide service in three different frequencies simultaneously--ultrahigh frequency (240 to 400 MHz), L-band (1.5 to 1.6 GHz), and C-band (4 and 6 GHz). UHF frequencies are used by the U.S. Navy communication links between shore and shipboard terminals and the satellites. Commercial maritime services include voice, teletype, facsimile, and high speed data. L-band frequencies are used for commercial communications from ship to satellite. The C-band frequencies are used for commercial communications links between the satellites and Earth stations on each coast of the United States. Satellite tracking, telemetry, and command functions also are conducted over C-band frequencies. Before the launch of Marisat, the American Institute of Merchant Shipping emphasized the need for functional transoceanic communications to maintain ship-to-shore contact with globe-circling ships on the high seas. According to the Institute, ship owners had previously reported being out of contact with their ships for as long as 48 hours, and the average delay for a message had been about 12 hours. For commercial shipping, the Marisat system is providing high quality communications channels around the clock. Launch vehicle for the satellites was the McDonnell Douglas Delta-2914. At liftoff, Marisat weighed about 1450 pounds (656 kilograms). Each satellite is 12 feet 6 inches (3.81 meters) in height and 7 feet 1 inch (2.15 meters) in diameter. A cylindrical solar panel, covered with approximately 7000 solar cells, supplies each satellite with primary power of 330 Watts. The satellites were launched from Cape Canaveral by the National Aeronautics and Space Administration under contract with Comsat General.